Multiple improvements have been proposed for Memorial High School’s athletic facilities. Memorial High School’s girls JV soccer team practices on Monday. The anonymous group of donors who had pledged $1.2 million for athletic complex improvements at Memorial High School withdrew their offer late Monday night. The announcement came after the Eau Claire school board voted unanimously to accept a $1.2 million donation to improve athletic facilities at Memorial, but on the contingency that a private sponsorship agreement be accepted by both parties. In an email while the board’s Monday meeting continued, board President Joe Luginbill and schools Superintendent Mary Ann Hardebeck said the donors withdrew their proposal due to the outcome of the board’s vote. The initial proposal brought to the board in January called for the district to match a group of anonymous Eau Claire residents’ $1.2 million donation to the project. Foremost among the improvements was the installation of artificial turf at the site of Memorial’s track. Other improvements include resurfacing that track, making upgrades to other track and field areas, installing new lights and a scoreboard and constructing a main entrance and storage building that include public bathrooms. But before a crowd of roughly 75 people on Monday, the board voted unanimously that accepting the donation be contingent on a private sponsorship agreement in coming up with the district’s half of funding. 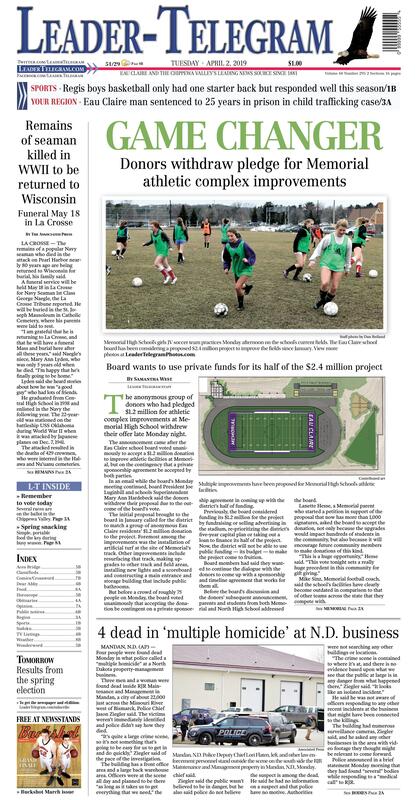 Previously, the board considered funding its $1.2 million for the project by fundraising or selling advertising in the stadium, re-prioritizing the district’s five-year capital plan or taking out a loan to finance its half of the project. Now, the district will not be able to use public funding — its budget — to make the project come to fruition. Board members had said they wanted to continue the dialogue with the donors to come up with a sponsorship and timeline agreement that works for them all. Before the board’s discussion and the donors’ subsequent announcement, parents and students from both Memorial and North High School addressed the board. Lanette Hesse, a Memorial parent who started a petition in support of the proposal that now has more than 1,000 signatures, asked the board to accept the donation, not only because the upgrades would impact hundreds of students in the community, but also because it will encourage future community members to make donations of this kind. Mike Sinz, Memorial football coach, said the school’s facilities have clearly become outdated in comparison to that of other teams across the state that they compete with. Melissa Lokken, a north side parent, said ahead of the board’s vote that she doesn’t believe the board should approve the proposal, especially in light of the district’s continuing budget issues. Lokken suggested Memorial students and parents work to fundraise the district’s half, or that the board take more time to consider the proposal. • The board approved the lottery system for the Spanish dual immersion program as was recommended by the administration. That recommendation is as follows: Returning students are first priority and automatically enrolled in the next year of the program. Second, the siblings of returning students would be automatically enrolled if they apply for admission. Then, there would be a lottery open to Eau Claire school district students for the remaining seats with no preference given to students from a particular districts school. In the case that there are further seats that remain, a lottery would then be opened to open-enrolled students who apply for the program. The school will launch with a kindergarten class this fall at Longfellow Elementary. Each year, a grade level will be added so that kindergarten through fifth grade will be offered. Classes will be composed of half native English speakers and half native Spanish speakers. • The board delayed a vote to approve the virtual charter school due to some lingering questions from some board members and the late hour of the meeting. During a presentation to the board, Dave Oldenberg, director of academic services, and Andrew Seveland, academic services coordinator, recommended the program's programming start with a contracted service and using community feedback and enrollment shape future hiring of teaching personnel. The board had four options to consider: approving the charter contract and launching the school next academic year, approving the contract and waiting another year for further staff and programming development to launch in the 2020-21 school year, delaying a vote or voting down the proposal. The board elected to delay a decision. They will take up the virtual charter school again at the next board meeting April 15. LA CROSSE — The remains of a popular Navy seaman who died in the attack on Pearl Harbor nearly 80 years ago are being returned to Wisconsin for burial, his family said. A funeral service will be held May 18 in La Crosse for Navy Seaman 1st Class George Naegle, the La Crosse Tribune reported. He will be buried in the St. Joseph Mausoleum in Catholic Cemetery, where his parents were laid to rest. Lyden said she heard stories about how he was “a good guy” who had lots of friends. He graduated from Central High School in 1938 and enlisted in the Navy the following year. The 22-year-old was stationed on the battleship USS Oklahoma during World War II when it was attacked by Japanese planes on Dec. 7, 1941. The attacked resulted in the deaths of 429 crewmen, who were interred in the Halawa and Nu’uanu cemeteries. Many of the remains were transferred in 1947 to the Central Identification Laboratory, where laboratory staff were only able to confirm the identities of 35 men. The unidentified remains were then buried at the National Memorial Cemetery of the Pacific in Honolulu. The deputy secretary of defense in 2015 launched an initiative to identify the unknown remains. Lyden said the U.S. Defense Department contacted her family years ago to get DNA samples to identify his remains. The department’s POW/MIA Accounting Agency announced in September that it had identified her uncle’s remains through DNA, dental and anthropological analysis.